And the feral cats are digging their new food dispenser! When it becomes empty, it’s easy to refill the tube, and voila! Dinnertime. 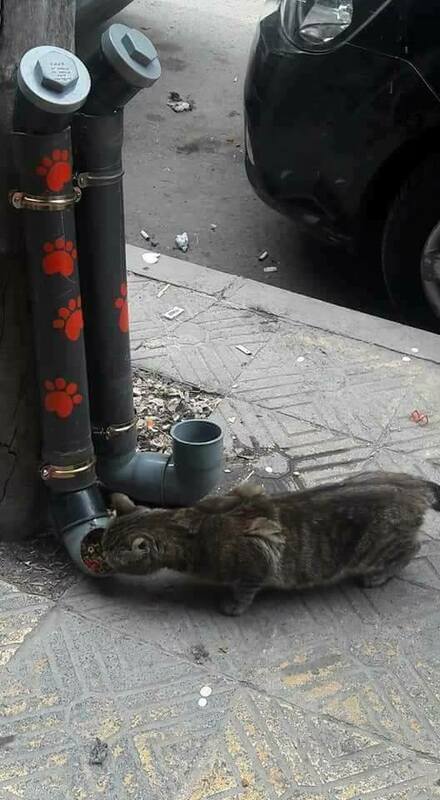 We are amazed at this innovative project out of Aleppo, Syria to help feed feral cats! Many rescue organizations and even individuals around the world work tirelessly to manage feral cat colonies, and it can be a challenging task. Here in the States, the ASPCA currently estimates that there are about 20 million free-roaming cats. 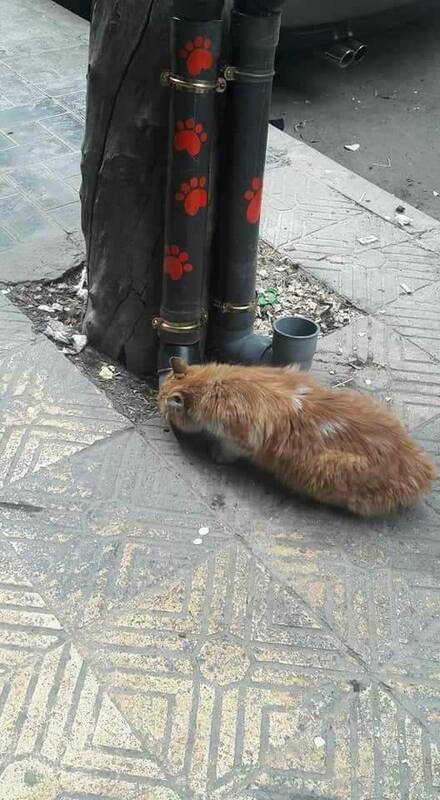 When you take into account providing fresh food, water, and medical care to dozens of cats, it’s not hard to see why this could be overwhelming. But sometimes you just have to get creative! That’s exactly what cat lovers in Aleppo, Syria did. Using piping, feeding tubes were constructed and placed on a tree for easy access. The piping could easily be found second hand … no need to buy new! 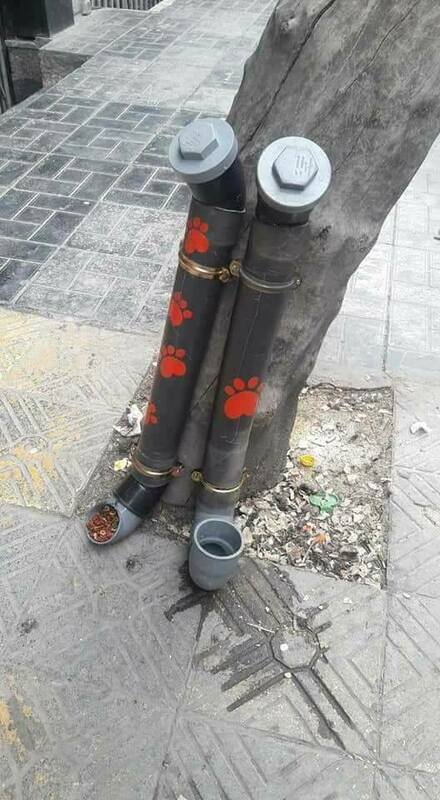 We think the paw prints are a great added touch! As the saying goes, helping one animal might not change the world – but for that animal, their entire world has changed. Do you know of a feral cat colony in your area but are unsure of how to help? Consider establishing a trap, neuter, and return (TNR) program! This practice helps reduce and stabilize populations of feral cats, according to Alley Cat Allies, one of the first organizations to promote the TNR concept in the U.S. Contact your local animal shelter for help, as well as the numerous resources Alley Cat Allies has available. 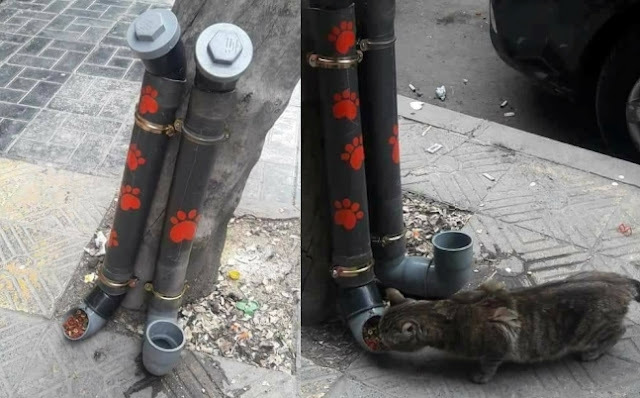 Responses to "People in Syria Came Up With Genius Way to Feed Feral Cats "